Gary Trent Sr. recalls the clock on his mother’s Cadillac reading 3:17 a.m. when she dropped him off on his first day of work. The former NBA power forward wasn’t starting a job at a 24-hour restaurant. He was selling crack cocaine to help support his struggling and drug-ravaged family. 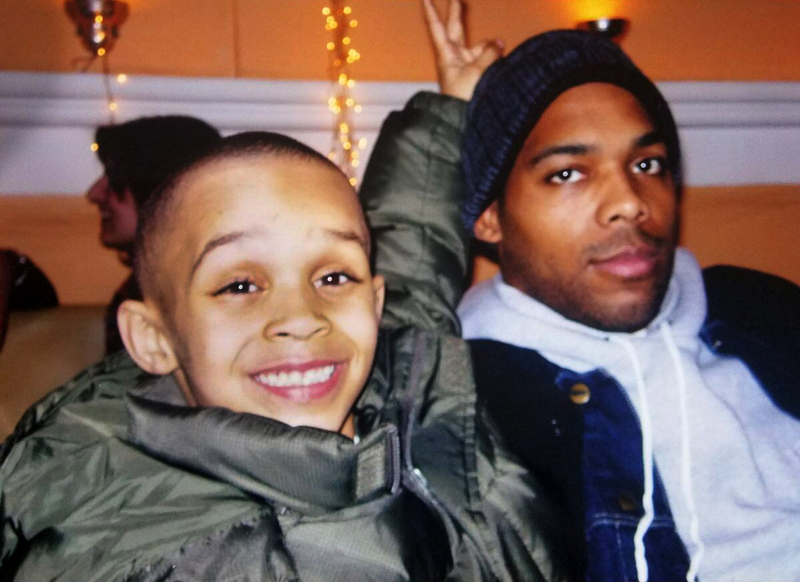 Trent Sr. ensured that such a nightmarish childhood would never be the case for his four sons, including his oldest child, Gary Trent Jr. The Duke basketball signee, who will play in the McDonald’s All-American game March 29, has heard all of his father’s horror stories, which has made him truly appreciate a much easier youth. While Trent Sr.’s NBA career has afforded his kids a better life, the hardworking, grinding reputation he earned as a player has been ingrained in his pro prospect son and other children. 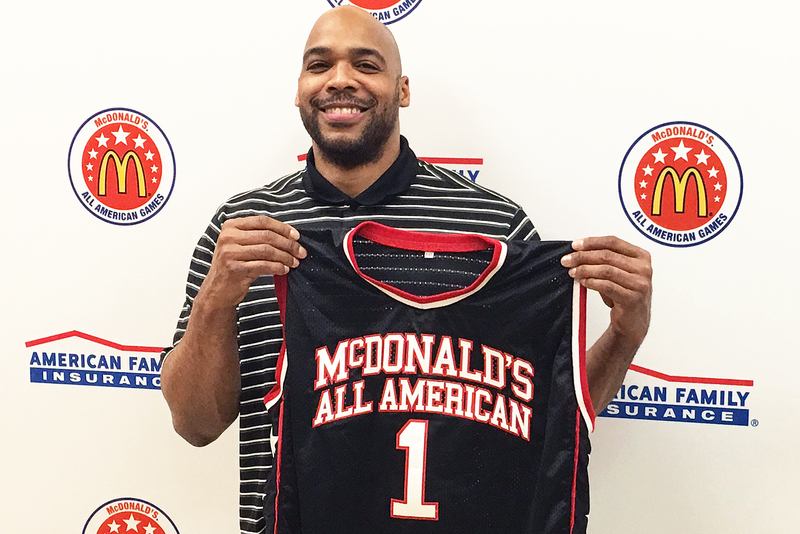 Gary Trent Sr holds his sons McDonald’s All-American jersey during a press conference. “He talks about his childhood all the time,” Trent Jr. told The Undefeated. “When me and my brothers start complaining about something, he’ll always say I didn’t have this or I didn’t have that. He’ll tell me crazy stories that I still don’t believe to this day. But fortunately I didn’t have to grow up like that. Gary Trent Sr. was born on Sept. 22, 1974, in Columbus, Ohio to Dexter Trent and Cheryl Gunnell, who never married and were engrossed in the drug life. His “cocaine kingpin” of a father was arrested and sentenced to federal prison, leaving behind an 11-year-old Gary and his younger sister, Tia, on the East Side of Columbus. Gunnell was a hairdresser by trade, but also was addicted to crack cocaine. Trent Sr. said she became a “zombie to the streets.” Trent Sr.’s grandfather died from alcoholism and his grandmother murdered her own son. “I’m not ashamed of my family. They just chose to be gangsters,” Trent Sr. said. Trent Sr. said money was scarce and often used by his mom for drugs when it was available. His mother once bought crack from one of his friends. By ninth grade, he was selling crack after his mother taught him how to make it. Trent Sr. said his mother’s new boyfriend had him selling packs of crack for him. “So at that point in time I just, I started taking my life into my own hands,” Trent Sr. said. “And when you give an 11-, 12-, 13-year-old kid his life in his own hands … Like I always tell people, ‘A burden is nurtured.’ You talk to the plants, you water the plants, you fertilize the plants and you nurture them. Then there’s weeds. Weeds are still going to grow. They might grow up a fence, up a wall, through the cement crack. They are still going to grow. Trent Sr. said he and his mom and sister lived in a home without gas for two years. Gone were the warm showers and ability to cook on a stove. As a freshman at Columbus Briggs High School, washing up adequately before class was a daily challenge. “This is when microwaves were still small in ’89,” Trent Sr. said. “Take a Tupperware bowl, run the water and stand at the sink and wash up out that bowl. And I wasn’t able to rinse my body off, so I rinsed the soap out of the rag and just wiped all the soap off. That’s how I was washing up every day. Just wasn’t nothing else for me to do. In hopes of making clean money, Trent Sr. took a job at a Long John Silver’s fast-food restaurant in Columbus at age 14. He lied about his age, saying he was 16 in order to get the gig. With an hourly salary of $3.35 before taxes, Trent Sr. said, he ended up making about $275 after a month’s worth of work. Trent Sr. said his mother took that money and bought cocaine to chop and sell crack. Trent Sr. initially would hold the crack in his hand before selling it in the wee hours. But at 14, his adolescent hand began tingling after the cocaine began to be absorbed into his pores. He next used pill bottles and bags to sell. “She went and bought seven grams of powder, took a Miracle Whip jar, some soda, whipped it up in the microwave,” Trent Sr. said. “She sat me down at the table. When it dried, cut it up like, ‘This is a 20, this a 20 [$20 worth of crack], this a 20, this is a 15 in the day, a 20 at night.’ I remember the whole conversation. This is before digital scales. This is triple beam scale times. There ain’t nobody else out there to cut it all up. Gary Trent of Ohio university on the bench during a game against Toledo in Athens, Ohio. Trent Sr. said he grew tired of living in a “crack house” with no gas, watching his mother do drugs daily in front of his sister. After Trent Sr. and his mom started fighting physically, he said, he departed to the suburbs about 30 minutes away to live with his aunt in Obetz, Ohio, during his freshman year. His aunt had the same drug problems that his mother had. The difference, however, was that this home was not in the ‘hood. “When I stepped outside, there was less trouble potential,” Trent Sr. said. “There was no four or five of my homeboys standing on the corner. There was no strip to stand on that was the drug strip where everybody came and bought dope. There was none of that environment. Trent Sr. ended up going back to school his freshman year at Hamilton Township High School after receiving a letter for truancy. He said the letter stated that if he didn’t return to school, his mother would go to jail. That’s when Trent Sr. first discovered playing basketball after a coach from his high school saw him on a playground. With a grown man’s size and strength, he quickly became a high school basketball standout and shot a national high school record field-goal percentage of 84 as a senior. Trent Sr. didn’t play AAU in the summers because he had to go to summer school to fix his horrible grade-point average. The diamond in the rough accepted a full basketball scholarship to Ohio University after one phone conversation with then-coach Larry Hunter. Trent Sr. was so eager to get away from home that he took the first scholarship he got. The 6-foot-8 Trent Sr. was a star from the time he stepped on the college campus in Athens, Ohio. He realized he had NBA potential when USA Today named him to its All-Freshman team in 1993. The brawny, undersized power forward earned Mid-American Conference Player of the Year honors three times and was nicknamed “The Shaq of the MAC.” Ohio would later retire his No. 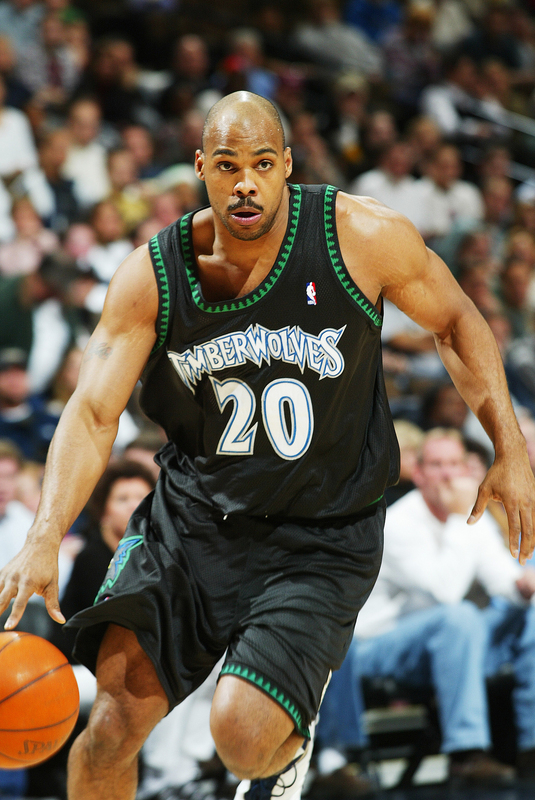 20 jersey after he averaged 22.7 points and 11.3 rebounds during three seasons. 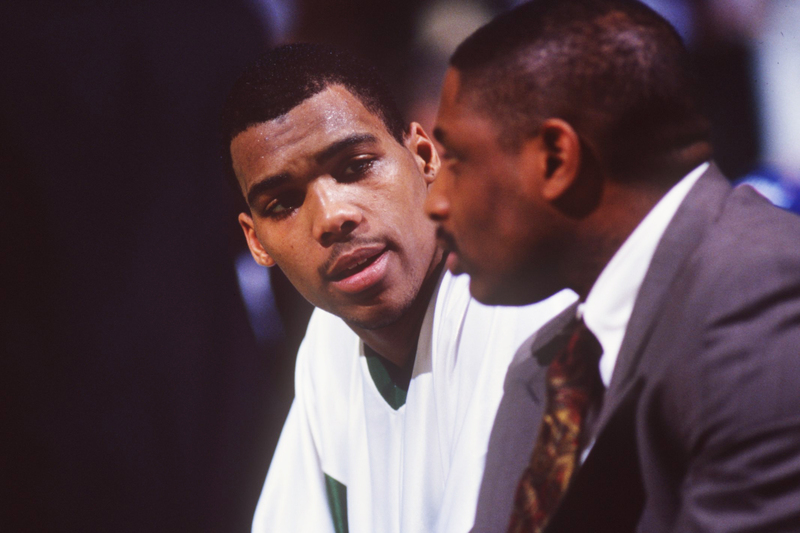 Trent Sr. was drafted with the 11th overall pick in the 1995 NBA draft by the Milwaukee Bucks, who dealt his rights to the Portland Trail Blazers. During nine NBA seasons, Trent averaged 8.6 points and 4.5 rebounds for the Blazers, Dallas Mavericks, Toronto Raptors and Minnesota Timberwolves. He made $11 million during his NBA career and also played professionally in Greece and Italy before retiring in 2006. Trent Jr. expressed respect for his dad’s journeyman NBA career that included 506 games. “Every year he had one-year or two-year contracts, where he had to earn it every year so he had to bring it every day in practice. He had to bring it every game. I remember him being a hard worker. Just being a big bruiser,” the 18-year-old Trent Jr. said. Trent Sr. somehow stayed out of major trouble as a child and his occasional fights at Ohio with classmates were handled privately, but there were a few bad incidents during his NBA days. He had a 1997 domestic violence charge for assaulting his then-girlfriend Roxanne Holt. That same year, Trent was involved in a fight in a Portland nightclub in which he hit a man over the head with a pool cue. There was also a suspension and $10,000 fine while with the Mavericks in January 2000 after he stormed into the Golden State locker room and challenged Warriors guard Vonteego Cummings. His NBA career ended in 2004. Looking back, Trent Sr. offered regrets and growth. “I didn’t realize what I meant to society and to people at that time,” Trent Sr. said. “I’m looking at hooping as hooping. I didn’t know if you beat somebody up, they would sue you. I didn’t know that existed. I thought you could only sue somebody if you got in a car wreck. I didn’t know if you beat me up, you could be sued and all that. I done been sued. I didn’t know that existed. Trent Jr. was born on Jan. 18, 1999, in Apple Valley, Minnesota, to Trent Sr. and Holt. Trent Sr. wanted to be the father he never had. He was available during the birth of his first child because of the NBA lockout that ended two days later. The 1998-1999 season was shortened to 50 games. Trent Sr. would often stretch out his son’s arms and legs when he was an infant, to create “muscle memory.” After retiring from basketball, he moved back to Columbus in 2006 with his main focus to spend time with his son. He said Trent Jr. moved in with him and his wife, Natalia, full time when he was in the fourth grade. An excited Trent Sr. would pick up his son from school and have a Subway sandwich waiting for him. After his son studied, he would take him to his football and basketball practices and be there to watch or coach. Pops also drove him to AAU tournaments, where they enjoyed long talks. Trent Sr. also became a mentor to many of his son’s teammates. As important as it was for Trent Sr. to spend time with his son, it was just as important on the flip side. Courtesy of Gary Trent Sr.
Trent Sr. said he has been described as “Joe Jackson” by his friends because of the way he coached his first son. Trent Sr. had Junior run with a basketball on a track and do push-ups and sit-ups at age 6. After the youngster’s youth league games, they would go somewhere to eat afterward and go over the game film on a camcorder. Pops pushed his son to be a well-rounded, skilled basketball player. And when Trent Sr. was giving too much tough love, his wife, Natalia, would be there to be nurturing. Trent Jr. accepted it all. “I was, like, that’s true. So, for the first year we did nothing but dribble around that track,” Trent Jr. said. “I would dribble a mile’s worth and at each 100 meters I would do 10 push-ups and 10 sit-ups. So that ended up being 160 push-ups and sit-ups. So we just continued to do that for about the first year. While living in Minneapolis and Columbus suburbs, Trent Sr. also ensured that his son had a diverse and healthy upbringing. Trent Jr. lived in a stable, suburban home with a father, mother and everything he needed. He got a quality education at private schools and elite public schools in Minneapolis and Columbus. But Trent Jr. also was able see what it was like to struggle when spending time with many of his underprivileged teammates or with less fortunate family members. Trent Sr. eventually got a business degree from the University of Phoenix. And whether it was on or off the court, he constantly pushed his son to be hardworking and humble. 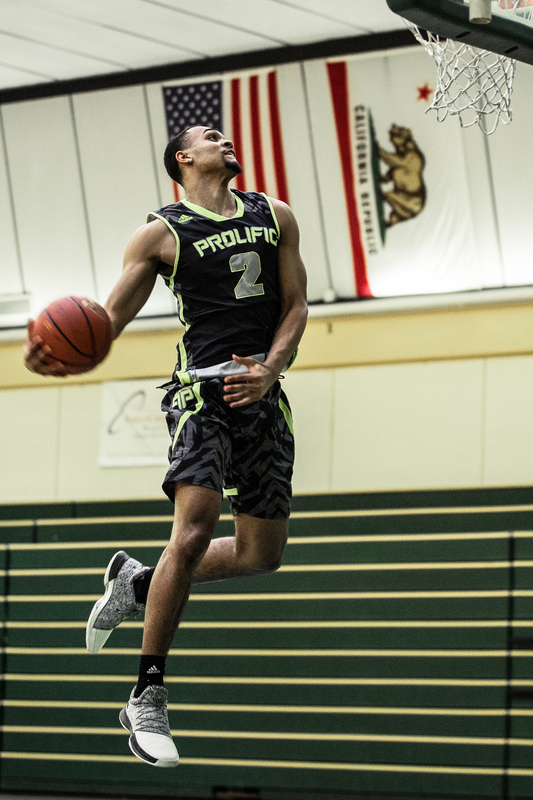 Trent Jr.’s hard work has made him one of the nation’s top high school basketball players. The 6-foot-5, 200-pound guard is ranked as the eighth-best senior in the country by ESPN 100 and the top shooting guard. He averaged a team-high 31.8 points and 6.4 rebounds while shooting 39.3 percent from 3-point range through 18 games for one of the nation’s top prep basketball programs, Prolific Prep in Napa, California. Trent Jr. has a 3.1 grade-point average this year at Napa Vintage High, according to his coaches. The NBA prospect also signed a letter of intent to play for Duke on Nov. 10, 2016, and will be playing in the McDonald’s All-American Game, the Jordan Brand Classic and the Nike Hoop Summit. “Gary is physically mature already,” Duke coach Mike Krzyzewski said on the school’s website. “He’s strong and can score the ball. But he can also defend. That’s the thing that impressed me during the summer circuit, is his willingness to cover the best perimeter player on another team while still putting up points. “I told my son, ‘First, go to a basketball school. Secondly, don’t make it a basketball decision.’ Since everybody [is going to] use you the same way basketballwise, this a business decision,” Trent Sr said. Trent Jr. said his dad didn’t let his upbringing define him, but it helped him become the man he is today. He said his father deserves credit for the man he is becoming.